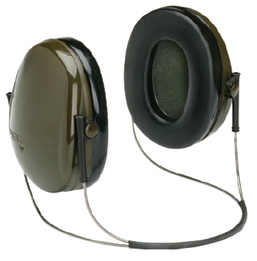 3M Artillery Earmuffs H6B are neckband (aka behind-the-neck) style earmuffs with no rigid headband. The greatest advantage of these neckband style Artillery Earmuffs is the ability to quickly put on and take off the earmuffs any time, without the need to remove a helmet. This earmuff is fully compatible with most current protective combat helmets used by the U.S. military, including ACH. These are extremely low profile, light-weight ear muffs designed for military, police, and tactical specialists in general. Neckband style earmuffs offer moderate NRR 19 hearing protection.